Eskadia, the City Upon the Sea, stands upon the edge of the world. 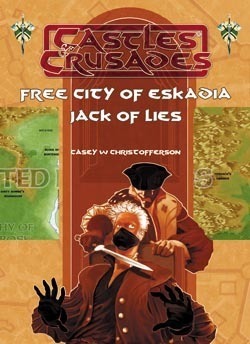 Eskadia is a web of city politics spun by the spiders that run all men;s affairs. There are those who think only of the good they are doing, others still who seek money or fame at any price, and still others who are little more than puppets whose strings are pulled by those that dwell in the shadows. Above all are those whose hunger for power knows no bounds. In this dangerous web of deceit and corruption; back alley knife play, espionage, tavern brawls, and street duels are as common as trade and traffic.